Photo Tour: This tour goes through Northern Peru which is a wild region which includes many endemic and spectacular species. On this trip we will see up to 50 species of hummingbirds and photograph most of them, wildlife includes the Spectacled Bear at Chaparri Ecolodge, probably the best location to photograph the only South American bear species. Other wildlife should include Sechuran Foxes, marmosets and more. 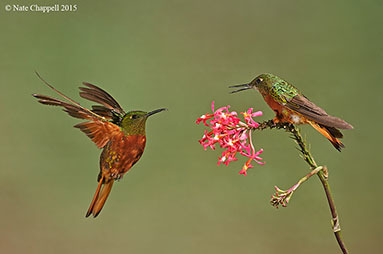 It includes 2 nights at the best location to photograph the incredible Marvellous Spatuletail hummingbird. 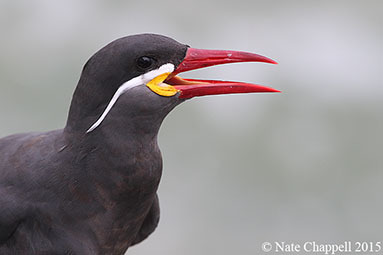 We spend the first afternoon in Lima photographing the Amazing Inca Tern. The extension features Machu Picchu and we will continue to seek out native birds. Tour Leaders and Guides: Charles VanTassel and Guilherme Battistuzzo. Charlie and Guilherme will help you get amazing images. 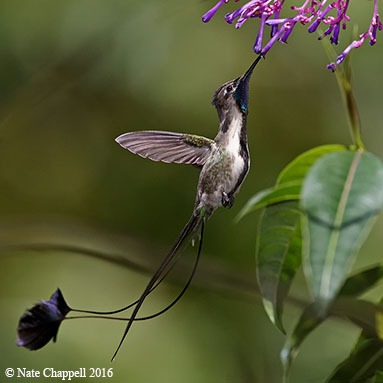 Charlie is an excellent photographer from San Deigo, California who has done a lot of bird photography in Central and South America. 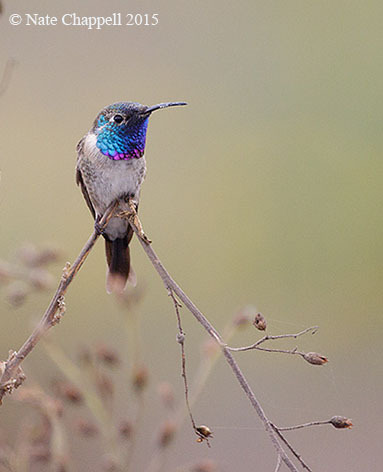 Guilherme is one of the top birders in South America and a fine photographer. ﻿Our guide, Jose, is a top notch bird photography guide who has been guiding all over Peru for the past 10 years. He is also very knowledgeable about the Inca ruins and archaeological sites. Cost: $5,950 with a $700 single supplement. Cost for a nonphotographer spouse/companion is $5,450. Deposit to reserve your spot is $1,500 per person. It includes all meals, lodging, transportation within country including in country flights, guiding, entry fees, drinking water and instruction. It does not include international flights to arrive and depart to/from Lima, Peru. It also does not include other beverages, tips and items of a personal nature such as phone calls laundry etc. 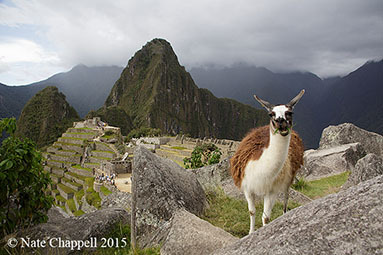 The cost of the Machu Picchu extension is $2,950 each with a $400 single supplement. Cost for nonphotographer spouse is $2,700 and includes in country flights, meals, lodging, transportation, entry fees and guiding. 2020 Cost: 6,450 with an $800 single supplement, nonphotographer $5,900. Maximum Participants: 6 photographers and 10 total participants. June 22nd - Arrival to Lima International Airport, transfer to a 4 star hotel in the Miraflores district near the coast. For those who arrive by mid afternoon we will have an outing and dinner at Rosa Nautica restaurant on the waterfront. This is a great place to get close ups of Inca Terns. June 23rd - Today we will have a morning flight to Chiclayo in Northern Peru. We will arrive at Chaparri Ecolodge in time for lunch. We will spend the afternoon photographing at the bird feeders and around the lodge area. Sechuran Foxes are often around the lodge area. June 24th - We will spend the full day photographing at Chaparri Ecolodge. 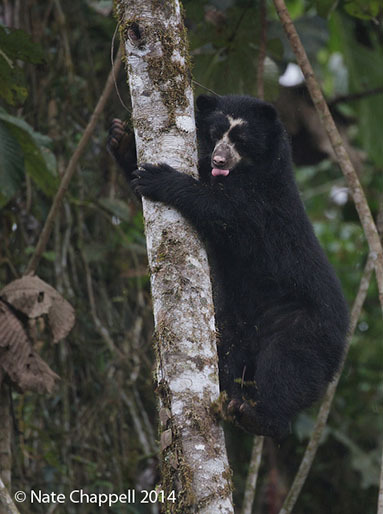 They rehabilitate Spectacled Bears here and they can be photographed in large, natural enclosures. In addition we have a very good chance of seeing and photographing totally wild bears. Chaparri has a pool that hummingbirds come to bathe in each morning and it's feeders attract great birds like the very endangered White-winged Guan and the beautiful White-tailed Jay. June 25th - We will spend the majority of the day photographing the bears and birds of Chaparri Ecolodge. In the afternoon we will drive to a comfortable lodge outside of Chiclayo, Peru. June 26th-27th - We will spend the next 2 days working our way across Western Peru stopping at a nice hotel in Jaen, Peru. During these 2 days we will be targeting birds such as the Peruvian Plantcutter, other Northern Peru endemics and Andean Condors. 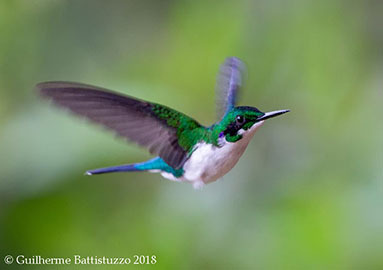 On the afternoon of the 27th we will arrive to Huembo Lodge, home of the amazing Marvellous Spatuletail hummingbird. 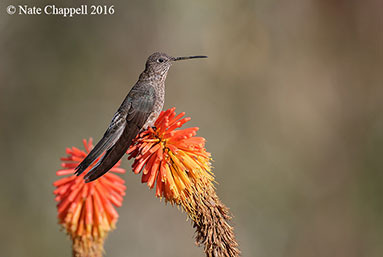 June 28th - Full day photographing the hummingbirds including Marvellous Spatulatetail and other species at Huembo Lodge. June 29th - Morning photography at Huembo Lodge folowed by afternoon transfer to Owlet Lodge, the best ecolodge in Northern Peru. June 30th and July 1st - We have 2 full days of photography at and around Owlet Lodge. 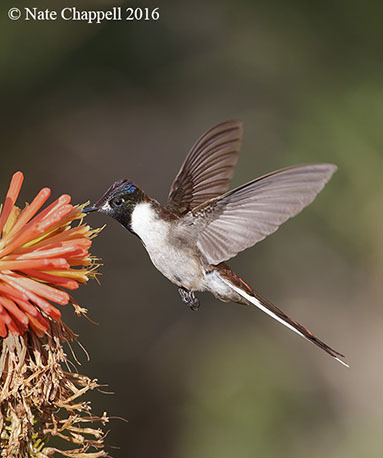 It's feeders attract lots of hummingbird species including Sword-billed Hummingbird and Long-tailed Sylph. We will do some mutli-flash photography here. There are endemics such as the Royal Sunangel to be found in the area as well. July 2nd - Morning photography at Owlet Lodge followed by transfer to Fruiteater Lodge, on the way we will stop at a reliable location for Saddle-backed Tamarin. 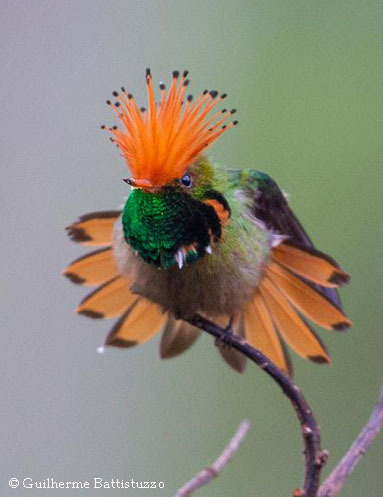 July 3rd - We will spend the full day today photographing at Fruiteater Lodge, this is the best location to photograph the amazing Rufous-crested Coquette. July 4th - Morning photography at Fruiteater Lodge which has a nice tower for bird photography followed by afternoon transfer to Tarapoto, Peru where we will stay in a nice lodge. July 5th - Today we visit feeders which attract other hummingbird species such as Gould's Jewelfront. In the afternoon we will fly from Tarapoto back to Lima, Peru. Evening at the hotel which is attached to the Lima airport. Those not doing the extension can fly out anytime on the 6th. July 6th - Morning flight to Cusco, Peru. Our van will pick us up and take us to our hotel in Ollantaytambo. We will have an afternoon visit to a local wetland which attracts many species including Andean Goose. Hotel: 4 star hotel in Ollantaytambo. July 7th - This morning we will take our van up a bit higher to look for endemics such as the White-tufted Sunbeam and Creamy-crested Spinetail. Hotel: 4 star hotel in Ollantaytambo. July 10th - We willl have a morning bird walk along the river looking for Torrent Ducks, Andean Motmots and other species followed by a train ride back to Ollantaytambo. Afternoon hummingbird photography in the hotel garden. Hotel: 4 star hotel in Ollantaytambo. July 11th - We will have a full morning of cultual photography in the sacred valley going to various archaeological sites. In the late afternoon we will return to Cusco and fly back to Lima. Hotel: 4 star hotel near the airport. July 12th - Fly home with a lot of great photos and memories.